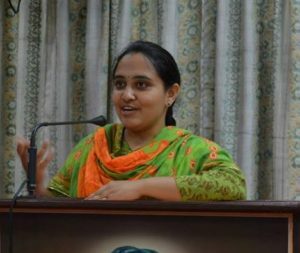 Swathi Ram is the National Coordinator for Youth for Sewa (YFS), an organization working in over 25 cities across India to bring change in society through volunteering. She has worked in disaster relief during floods in Uttarakhand and Chennai. She is an active blogger and an experienced IT professional. She is often invited to speak on topics like social work, volunteering and Swami Vivekananda’s message and philosophy. A DVD titled ‘Developing Inner Strength for Success – the Vivekananda Way’ featuring her talk was released by Ramakrishna Math, Hyderabad. We asked her questions about her experience in social work, its challenges, her ideas and goals for YFS. Following is the transcript of our discussion. Am an engineer by education, and had a good learning stint of 7 years in the IT industry, before following my heart and taking a plunge into working fulltime in the social sector. Why did you leave a corporate setting to pursue a career in non-profit? I have been influenced by the teachings of Swami Vivekananda from as early as I can remember, thanks to my parents who used to take me to the Ramakrishna-Vivekananda Math since a very young age. The seed of every individual being responsible to serve the nation and the needy was completely sown there, and only got compounded after being married to my husband from fortunately hails from the same background. It was only a matter of time then that choosing the less trodden path happened. Being a woman, what sort of challenges do you face when you go out to work in the field? I would say that there are a lot of challenges facing anyone who steps out to work in the development field, including opposition from the family, non-acceptance amongst the peers, and self-doubt itself, when everybody else in our circle is “progressing” in a different way. We only need to work with a firm conviction in the power of goodness, you will truly start being grateful for having been chosen as instruments of change. Yes, being a woman brings with it a couple of more challenges with enough circumstances trying to press you down, but again, all that matters is that you believe in yourself and keep moving forward. As long as I know that I am doing justice to all the roles I play, I have learnt to lend a deaf ear to demotivating talks around me. Also, I would truly like to pay credit to my family, and the wonderful people at work, especially the men, who raise beyond the stereotyping barriers and recognize the true potential in a person beyond the same. Indian society has lot of divisions on the lines of cast, gender, language, religion etc. how does one develop a mindset to look beyond these divides? I have been fortunate to travel widely across the length and breadth of India, meeting complete strangers cutting across all kinds of divisions, and am overwhelmed by the love and affection showered upon. It only takes a genuine interest in connecting with people to cut through the any of the divisions. The factors which unite us, including the joy of giving, and working for the nation, definitely stand above all kinds of barriers. It’s in us to have an open mind, go without expectations, be willing to accept the diversity of human life for it’s beauty, than try to fit everyone in the same mould. How Swami Vivekananda’s teaching influenced you at a personal level? Swami Vivekananda credited whatever he achieved in life to his Guru Sri Ramakrishna Paramahamsa, and took none for himself. Such a magnanimous personality, whose teachings are as relevant today, as when he had uttered them more than 150 years ago, is the best leader anybody can ask for. He dreamt and worked towards rebuilding a glorious India by harnessing the potential of youth power, and that has been his major influence on my life and work. While organizing disaster relief what are some of the key things that one should keep in mind? It is defintely laudable that people spring to action and donate a lot of clothes, food stuff and so on, as soon as there is news of the onset of a disaster. However, it is more impactful and would also ensure that time and resources do not go waste, if people try to find out the actual needs on the ground/ choose to donate in cash, so that whatever is more important at that point of time is purchased and made utmost use of. Also, the whole logistics of sending resources from far away locations costs a lot in terms of time, money and efforts. Hence, it always makes sense to donate cash to organizations you believe in, or donate in kind after gathering the requirements from reliable sources. I have personally witnessed a lot of thin cottons lying in Uttarakhand, when what they would have probably required were thick blankets to beat the winters. Also, the kind of clothes we wear may never be what they have ever been used to. I have also met people who feel someone in need should just take whatever we give, but well, along with it being ‘not-the-right’ attitude, it’s also not easy for anyone to embrace change so easily. Isn’t it? How do you train or mentor girls and women for leadership roles in their communities? The feminine power (Shakti) is associated with the qualities of nurturing and sustenance, which are extremely important aspects of leadership, and ensure that women take their entire brood along when they are uplifted. All it takes for a woman is to realize that she can balance between her different roles, and do justice to each of them. There is inherent potential in each being, be it man or woman; and like Swami Vivekananda says, we only need to facilitate it’s manifestation. Spend time with them, make them realize their strengths, help them work on building the same, while also letting them play their other roles too. They will surely come to realize that their various roles only complement each other, and help them be better at each of them. Do you think talented individuals form organizations like YFS should take political route to bring a positive change at a much bigger level? I truly believe that India today needs leaders in all spheres, and the youth population that we have is a blessing in this direction. YFS aims at creating changemakers who work for the nation without any vested interests, while being catalysts in creating more like them. Such leaders would surely be needed and should work in any area which interests them and where they can contribute their best, while keeping the core of their beliefs and positive traits alive. What plans do you have for YFS in the coming years? Be good, do good, and the rest will follow. Take your first step towards Seva NOW! Even just 2 hours a week makes a big difference to someone, and more so for yourself. You would be the real beneficiary.